I’ve had an interesting permission for the last couple of years. It’s just over 4 acres and is exploding with rabbits which the owner wants controlled. However there’s a catch… The permission is a massive lawn, with no cover at all. 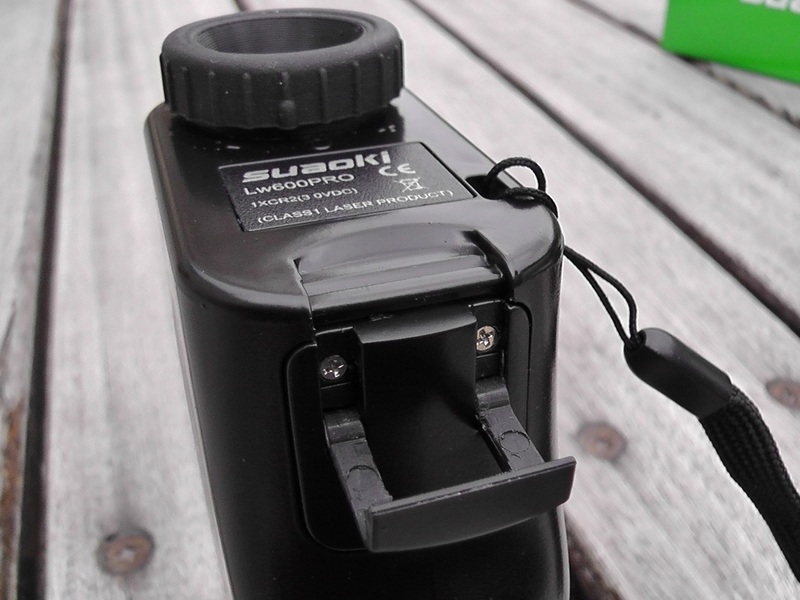 My first impressions were that this is a very small and light weight range finder. The picture shows everything that comes in the box, except the included battery which I had already installed in the unit. The battery compartment is meant to be water proof, works by compressing a rubber o-ring with two screws to create a seal. My real concern here is that these screws are self-tapping straight into the plastic, which will probably mean they will turn out the holes with time. This wouldn’t stop the compartment closing, I’m just not sure how water proof it will be in the long run. Also shown is they eye piece which can be adjusted to get the optical image and digital reading in focus. Talking of optics, the lens is 6 x 21 and pretty much spot on for airgun ranges and quarries. 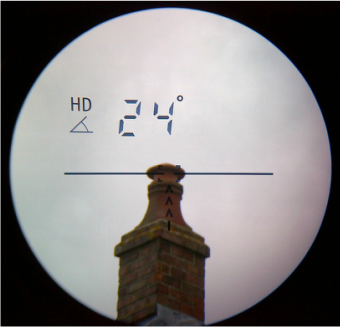 You do have to get your eye very close to the eye piece to get a full and clear picture, but it is relatively sharp and useable in most daytime light conditions. The depth of field isn’t great, and your eye will usually focus to give a sharp image of the landscape rather than the readout. That said, the read out is never so blurry as to be unreadable, and you can always adjust the eyepiece if necessary. Don’t get me wrong, it’s a good image none the less. The box states it can measure from 4 – 600 metres. However, it can easily be switched to give a reading in yards which is my preferred unit for shooting distances. I verified some distances around the garden with a tape measure it is seemed bang on the money. As well as measuring distances in metres and yards, the unit can do some other cleaver things like measuring speeds and angles. Angles are particularly important to air gunners, especially if shooting up into trees or barn roofs. As a general rule, the steeper the upward incline, the less you need to hold over and range, and you may even need to hold significantly under for very steep angles (see Ted’s informative video for more information). Although not obvious from the user manual (several pages are simply left blank in mine!) angles can be measure with this unit using horizontal distance (HD) mode. 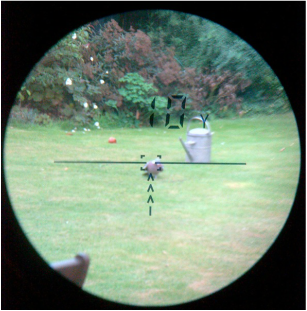 I’ve given a couple of example photos to show what it looks like through the eye piece when the range finder is in action. The centre of the rectangle is where the laser is measuring too. If you’re lying down it is sometimes best to take a few readings to make sure the laser is on target and not hitting the ground in front or behind it. The digital read out isn’t illuminated, which does make it hard to use in low light and impossible to use at night. 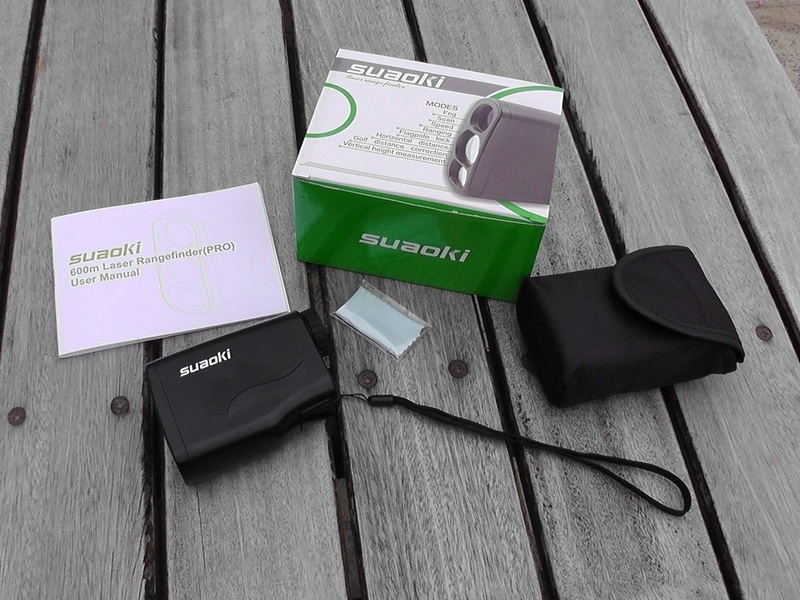 Suaoki offer a very similar model with an illuminated side screen which might be of use for lamping, but I wouldn’t like to say for sure as it isn’t something I’ve ever tried. Before I tried using the range finder out in the field I wanted to make sure that the gun, rifle and range finder were all set up to work together. I chronied the rifle and as usual it was bang on 558 fps with 15.9gr JSB exacts. The data went into chairgun, and the results are shown in my review of my new scope. I then took the whole set-up down to my local air gun range. Whilst I could have done this on my permission, sometimes it’s fun to plink steel and talk to other local air gunners. The session went something like this. Point range finder at ‘long range’ target. Use the read out to calculate hold over. Take aim with the HW97k. Knock down target. Not only did this shooting session show me the set-up was good for shooting out to 50 yards, but it was also an enormous confidence boost for my shooting generally. Since then the range finder has proved itself to be a valuable piece of kit in the field. So is a range finder a good investment? The short answer is yes. The long answer is yes, but not in its own right. If you want to use this to extend your airgunning distances, you’re going to need a chronograph and quality mil-dot scope. You’re also going to need a very consistent airgun (not a budget spring or CO2 gun…). However above all you’re going to need to practise. Practise on paper and steel, and don’t be afraid to put a lot of pellets down range. If you can do your bit with the help of a range finder, you’ll be surprised what a good airgun set up can do.